Escape from Tehran … to find the real Iran! Before I left for Iran, I was worried or others discouraged me or even predicted tragedy. Once I arrived, I was shocked how things did not match what I expected. Now I am so grateful for having gone to Iran and hope to return soon. Now that travel to Iran is surging, I see such reports on nearly weekly basis. It’s the classic example of preconceptions – built over four decades of misinformation and fear – not matching reality. I must admit, the morning I left the house to start my travels, I suddenly started to get nervous. What if this would be the last time I make a cup of tea in this kitchen, the last time I would drive down this road? I saw so many different and unique places, all of them amazing. The people were, 99 per cent of the time, very friendly and excited to see me in their country. The one per cent were mainly wondering, out of confusion, why I was there with my camera as they were not used to seeing people like me there. Despite the erroneous western image of a “hostile country populated by flag-burning fanatics”, welcoming smiles were everywhere during our three-week visit to Iran. Tourists are not hard for locals to pick out – there aren’t that many around due to the totally erroneous image in the West that Iran is a hostile country populated by flag-burning fanatics. Nothing could be further from the truth. 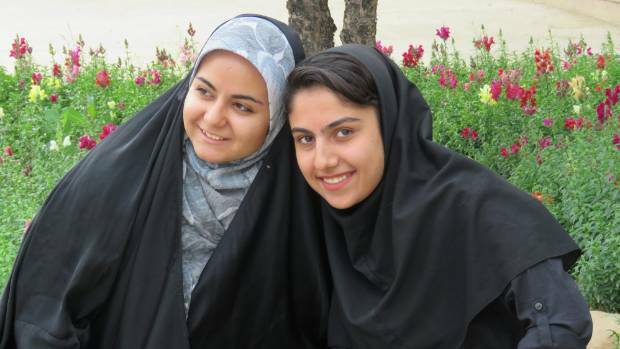 Iranians must rank among the most friendly and hospitable people in the world. My delightful encounter on a street in Tehran was to be repeated by both men and women in cities across the country: “welcome to Tabriz/Kerman/Yazd/Isfahan”. These were some of the most common responses I received when announcing my upcoming plans to visit the country. “I hope you’re not becoming a fundamentalist,” another friend half-joked. Iran was one of the countries that was considered high-risk when planning the route for this journey. Apart from Pakistan, Iran was one of the countries to get out of as soon as possible. We were wrong about Pakistan. We sure as hell were wrong about Iran. How Is Hitchhiking As A Woman In Iran? Never before have I been to a country whereby the preconceptions of it are so far away from reality. There is no war in Iran, the country is generally safe, and the living standards are comparable to those from Europe. The architecture is gorgeous, the landscapes diverse and the people ― the people of Iran are the best. They are incredibly kind and friendly, and always eager to meet foreigners with an open door and a cup of chai. It really is an amazing country. If someone in Iran says “you are my guest”, expect them to take complete care of you. It is one of the safest countries in the world for tourists. Before we set off to Iran there was fear. … Such was the response to us, an American couple, going to Iran. … It surprises people — we sometimes think they don’t believe us when we tell them that Iran was the country where we felt most like rock stars.